Motto: "The Land, The People, The Light" - "La Terre, Le Peuple, La Lumière"
The small island nation of Saint Lucia (pronounced "saint LOO-shuh") lies between the eastern side of the Caribbean Sea and the Atlantic Ocean. One of the Windward Islands, which are on the southern end of the Lesser Antilles, it is located north of the even smaller island nation of Saint Vincent and the Grenadines and south of the somewhat bigger French outpost of Martinique. Compared in shape to a mango or a teardrop, Saint Lucia is dominated by a mountainous landscape. The volcanic nature of Saint Lucia accounts for its being more mountainous than most of its neighbors as well as being arguably more beautiful, an opinion held by an ample number of tourists. The mountain chain runs north to south, with the highest point being Morne Gimie at nearly 1,000 m. The most imposing landmarks on the island are the twin-peaked pyramidal cones called the Pitons, also on the island’s west side and memorialized in the two triangular shapes at the center of the national flag. In the vicinity is the old town of Soufrière, which boasts one of the world’s few drive-in volcanoes. Saint Lucia’s mountains remain largely forested, and the interior has well-preserved rain forests. A third of the population lives in Castries, the capital. The country has an area similar to that of Chicago but a population (157,000) akin to that of suburban Aurora, Illinois. Martinique is about 40 km away across the Saint Lucia Channel while Saint Vincent sits 35 km distant across the Saint Vincent Passage. Both are visible from Saint Lucia on clear days. Hurricanes pounding in from the east have been an enduring threat to the island over the centuries, along with the landslides sometimes caused by the cyclones. The storms hit Saint Lucia directly about every 20 years on the average; the last major one was 1980's Hurricane Allen, which caused mainly economic damage and went on to slam the Houston area. But usually the winds are calm and bring a cooling effect to the tropical temperatures. There is a rainy season from June through November, but the level of precipitation is not emphatically different from the rest of the year. 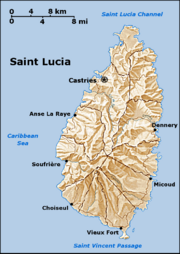 Arawak tribes settled on Saint Lucia around 200 C.E. but were forcefully replaced by another Amerindian group, the Caribs, about six centuries later. The starchy foods they cultivated are still a staple of the local diet. The discovery of the island by Columbus at the beginning of the sixteenth century is believed doubtful by modern historians, but other Spanish explorers did make landfall in subsequent voyages of discovery. The prevalent theory for the derivation of the island’s name is that a band of French sailors, shipwrecked early in the sixteenth century on its shores, named it for Saint Lucy, a third century Sicilian martyr. Within a few decades several countries, as well as pirates acting on their own, made brief attempts at settlement, beginning with the Dutch in 1600. The Caribs’ fierce resistance resulted in the abandonment of some attempts, but the most significant conflict was between the British and the French, who from 1650 to 1815 caused the island to change hands 14 times. Even when the British took over, though, French settlers tended to stay, which is reflected in the common, but unofficial, language of the island being a French patois. The Caribs were in time battered by Western diseases and dwindled away. Slavery was introduced in the 1760s by putting Africans to work first in small cotton and tobacco holdings. Later, sugar cane became the predominant crop worked on large plantations. Before slavery was completely abolished in 1838, there was significant political unrest caused by escaped slaves taking refuge in the mountains but wreaking havoc on the settlements. The Treaty of Paris put Saint Lucia in British hands to stay, initially as its own crown colony. Soon after slavery’s end, laborers were brought in numbers from India as indentured servants to work in the sugar and other industries. Their descendants still constitute a small portion of the national population. From 1871 to 1958, Saint Lucia was part of the Windward Islands colony, which located its capital at first in Barbados and later in Grenada. For the next four years it belonged to the West Indies Federation, which attempted to unite ten island entities as far west as Jamaica, with a capital in Trinidad. The federation fell apart from internal bickering over substantial differences. Complete independence came in 1979. Four years later Saint Lucia joined the U.S. and some of its island neighbors in the invasion of Grenada to liberate it from Marxist rulers. In 1994, the country also sent a military contingent to Haiti to join the Americans in restoring that nation’s ousted, democratically-elected leader. Saint Lucia inherited the parliamentary system from the United Kingdom. Executive power is in the hands of a prime minister. Democracy has been stably maintained since before independence. As a Commonwealth realm, Saint Lucia recognizes Queen Elizabeth II as the head of state of Saint Lucia, represented on the island by a Governor-General. Executive power, however, is in the hands of the prime minister and cabinet. The prime minister is normally the head of the party winning the elections for the House of Assembly, which has 17 seats. The other chamber of Parliament, the Senate, has 11 appointed members. Saint Lucia is a full and participating member of the Caribbean Community (CARICOM) and the Organisation of Eastern Caribbean States (OECS). The island's productive volcanic soil has always been conducive to agriculture, but the principal crop has changed from time to time. Sugar cultivation largely died out by 1960, but it had in fact never recovered from the demise of slavery. The colony's economy benefited as well by serving as Britain's coal station in the Caribbean from the 1880s to the 1930s, but that too came to a close. At present the nation's main crop is bananas. Though one of the world's smallest banana-producing countries, the quality of the Saint Lucian product is considered first-rate. Tourism is the other mainstay of the economy, drawing mainly from North America and Western Europe. There is more diverse manufacturing in Saint Lucia than elsewhere in the Lesser Antilles, with garments, electronics assembly, and paper and leather goods being the major components. Oil refining, cargo facilities, and offshore banking are other constituents of the nation's economy. The wedding and honeymoon industry are an additional feature. Trade is mainly with the U.S., Japan, and the European Union. The local currency is the East Caribbean dollar, which is shared with seven other English-speaking countries in the archipelago. It is pegged to the U.S. dollar, which is in widespread circulation on the island. Despite the various elements to the Saint Lucian economy, disparities between rich and poor on the island are tremendous. There has been a growing middle class for many years, but a large impoverished population remains. The population of Saint Lucia is overwhelmingly of African descent; only 1 percent is of European origin, while those tracing their ancestry to the Indian subcontinent are about 3 percent. Though most islands in the Caribbean have small pockets of poor whites among their populations, it is not the case in Saint Lucia. English is the country's official language, but most people also commonly speak a French creole called patois or "patwa." It is virtually identical not only to the patois spoken in nearby Dominica but also to that in French-speaking Martinique and Guadeloupe. Estimates of the proportion of Santa Lucia's Roman Catholics are between 80 and 90 percent. The remainder are Anglicans and Protestants. One of the most surprising statistics about Saint Lucia is the high ratio between the size of its population and the number of Nobel laureates born on its soil. It is in fact said to be the highest rate in the world. Two winners have come from the island: Economist Arthur Lewis won the Nobel Prize in Economics in 1979; poet and playwright Derek Walcott received the Nobel Prize in Literature in 1992, his most well-known work is the poem "Omeros." A simple analysis of Saint Lucia's culture would probably find that British contributions have been in the areas of law, education, politics, and sports (the country is definitely cricket-crazy). The French left a legacy of music and dance, and made Roman Catholicism the principal denomination. Besides their sheer numbers, Africans contributed the Creole root of the local patois, while the Indians left a stamp on the island cuisine. Family values on the island can possibly be seen as pulled in opposite directions. There is a common extralegal practice of handing down inherited land from parents to all descendants, who continue to hold the property as an undivided parcel. On the other hand, it is also a common practice among men in the lower classes to father children and largely abandon them, though they may visit periodically. Saint Lucians are also known for a high degree of interest in literature and its production. ↑ Government of Saint Lucia, Office of the Governor General Retrieved November 5, 2011. ↑ Government of Saint Lucia, Members of the House of Assembly Retrieved November 5, 2011. ↑ 3.0 3.1 3.2 3.3 International Monetary Fund, St. Lucia World Economic Outlook Database, April 2010, Report for Selected Countries and Subjects. Retrieved November 5, 2011. This page was last modified on 5 November 2011, at 14:56.